I’m almost done with the book, and I have not had a ton of time to spend with it… it’s just so good that I’m tearing through it at a really fast pace. What can I say, it’s a real page-turner. a terrific book, and I highly recommend it. I don't agree with everything in it, but I'd be mad to expect to agree with every point in such a book. Harold does lay out clear principles which, if at least carefully considered, will make any reader a better user of XML. All I can say is that I use XML day in and day out and have learned everything I know by trial an error. I've made many mistakes along the way. I've tried my best to learn from them, but Effective XML was the book that made everything click for me. The best part is that the book went well beyond just helping me see my errors. I've already applied some of the ideas to new work I've done recently and have been able to head off some of the problems I would have encountered. Effective XML is by far the best XML book I've ever read, and quite possibly the best tech book I've read all year. I might even have to add it to my favorite tech books list. If you work with XML to any significant degree, I can't recommend this book highly enough. One thing that really stands out in the whole text is that the author isn't afraid to cover the dark side of XML. He will tell you where the design process was less than perfect, which tools have little practical value, and some of the problems with where XML technologies are headed. This isn't complaining though. All of this is targeted at how it affects XML developers today. You learn what you can safely skip and what should be outright avoided. The author even tells you what XML is bad at and gives you advice about when you shouldn't use it. That's the mark of a man who knows his subject, if you ask me. All told, I think the author failed to completely convince me his way is perfect on only 2 topics. That means I learned 48 expert XML tricks. Surely that's worth the cost of the book in time and money. This isn't the first XML book you need, but I think it is the second XML book everyone should read. Little time is spent here explaining the details of how to do things; instead the focus more is on when and why to do them. Or why not. The interest is mostly in core concepts like syntax and structure, DTDs, schemas, parsing, etc, emphasizing important but subtle details you may well have missed when you first studied them. The writing style is very clear, concise, and practical. I'd recommend this to just about anyone working with XML in some form. Harold is that rare writer who is both an expert on a subject and able to clearly explain that subject. Some of that no doubt comes from his being an adjunct profesor at a college in Brooklyn. Harold doesn't leave you wondering how he got to point C. He also doesn't use jargon or buzzwords just for the sake of using them. Right at the beginning of the book he clearly explains the difference between many of the common terms used in XML so that everyone is starting with the same lexicon. He also writes as someone who is eager to share his knowledge. I wish every book on technology was as enjoyable to read as this one. This is a book that, when taken to heart and used, will cause your coworkers to thank you. it is not just the quality of the technical content that shines through. The writing is clear and the examples wisely chosen. There is a lot to be learned here, and Harold clearly wants to pass on those practices and techniques which work best. This is an intermediate level book. It assumes that you're familiar with XML syntax and practices. It is not a tutorial. Rather it focuses on where and when to use what rather than how to use everything. It assumes you already know how to use XML. 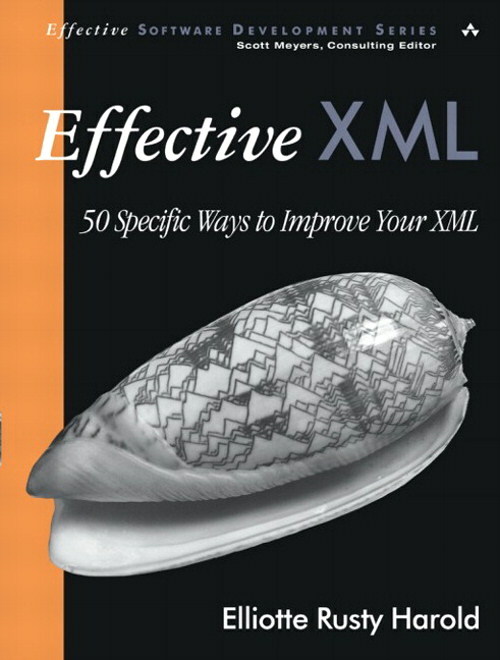 Instead, this book shows you how to use XML well. This book was written in OpenOffice Writer 1.0 on Linux. All files were saved in OpenOffice's native XML format. Some drawings were produced in OpenOffice Draw 1.0 on Linux. Others were done in StencilIt 1.0 on Mac OS 9.